Week 6 of my Eating Around the World Adventure led us to Greece. On this trip of ours, we spend a week eating food from our randomly picked country. After going through my six Greek cookbooks (which I didn't even know I had, as I have so many cookbooks, it is hard to keep track of all of them), I decided there was no way I could cook all the food I wanted to try in one week, so Greek week has turned into Greek month. First recipe up was this Slow Cooked Lamb Shoulder. 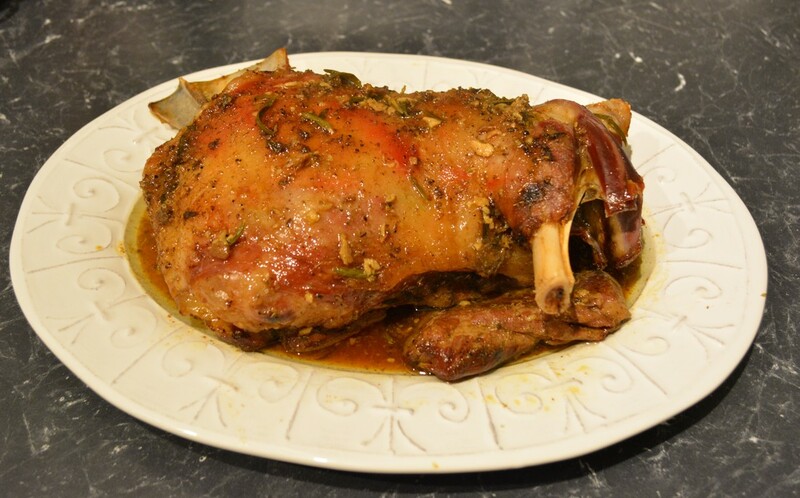 Now my mum has always made great slow roasted lamb, and she always loved using the shoulder, so I grew up on this, but this Greek version was just amazing. The garlic, the rosemary, the oregano, the seasoning, it was perfect. I served it with homemade pita bread and an assortment of dips, tzatziki, eggplant dip, Bean Skordalia and a Capsicum and Feta dip. This was one of those meals where you just watch your family eating your food and the fact they loved it so much, brought joy to my heart. This dish is salty, but I felt it needed it, adjust the salt if you prefer to use less. If you don’t have a cast iron pot, don't fret, just use a baking tray and cover it with foil. If you love Greek food this recipe came from a cookbook by Helena and Vikki Moursellas. If you love Greek food, this is book worth buying, simple, tasty recipes. If you are looking for a simple, yet tasty meal to serve your family, look no further. Preheat oven to 170C/150C fan forced. Using a mortar and pestle, pound the garlic, rosemary, salt, pepper and oregano. Add the olive oil and mix to combine. Rub the marinade over the lamb and place in a cast iron pot, then cover. Roast in the oven for 2 hours. Add ½ cup water and reduce the oven temperature to 150C/130C fan forced , then roast for a further 2 hours. Remove the lid and roast for a further 40 minutes to brown the top. There is no need to rest the lamb shoulder-eat it hot. I shredded the meat and then after removing the fat/oil that was at the bottom of my pot, poured the sauce over the meat. Serve it with Pita Bread and assorted dips as mentioned above or a simple salad.